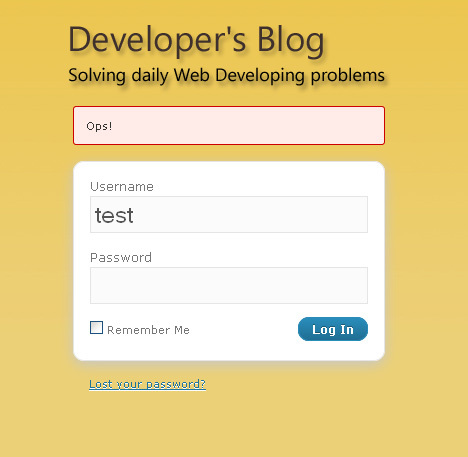 Yesterday we saw how to Customize the WordPress Login. Today we're going to finish it Hiding the Login Errors. Today's tip is something you should always add to all your WordPress projects. When you type a wrong password it tells you Hey, wrong password!. Also tells you when you just entered a wrong username. The point is we can not let the bad guys know what are they writing wrong. There is an easy solution. Add this line to your functions.php in your theme folder. Good tip, it’s awful how wordpress says if your username exists or not and is still unresolved. 4.789.800 post views so far. This page needed 46 queries to load.